Well! I'm hoping for a full week this week, because we're working on chronological order text structure. Snow, stay away! Last year, I wrote about questions to ask of chronological order text. This year, I'm going one step further to look at the different sides of chronological order text. More so than any other text structure, chronological order comes in great variety. This makes it important to help students see all of the different permutations of chronological order nonfiction so that they can use this structure effectively. How-to/Procedural: This kind of chronological order exists in an almost hypothetical time. Instead of telling about an event that has already happened, how-to texts look to the future to events that can happen. A great way to help students see different kinds of how-to texts is to look at directions for paper snowflakes. How are the different sets of directions similar? How are they different? Why is it important that directions are written in chronological order? What text features does the author use? Biography: Biography fits into an interesting category, straddling expository and narrative text. But these are great to use to look at chronological order. Often, biographies will start with an event from the middle or end of a person's life, and then go back and tell the story in order. Look at how biographies link events and show the passage of time. It's interesting to get several biographies of the same person and look at how the authors played around with time in each one. How does the author show the passage of time? What parts does the author skip? How does the author show the chain of events? Is there a timeline that puts it all together? 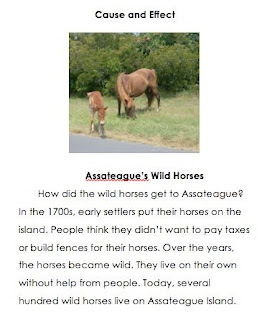 Animal Life Cycle: This sub-genre of informational text is popular with kids! These texts show how an animal grows and develops. Often, they include the familiar cycle diagram that shows how one life stage leads to another. John Himmelman writes many lovely books that show the life cycles of different animals. Others can be found in Toolkit Texts or on the shelves of the library. How does the author connect the events? Is there a diagram that summarizes the life cycle? How are these texts similar to other chronological order texts? Historical Events: These texts can tell about an event over time, or show how something has developed and changed over the years. These are often more difficult for students, and are a kind of text that they are less likely to pick up and read on their own. But understanding how chronological order is shown in these texts is essential for students who need to understand content area texts. Why are these texts written in chronological order? What is the time span of the event? To help my students understand these different kinds of texts, I've made a set of centers that show the different kinds of chronological order texts. We'll see how it works--if the storm stays away! View more documents from Emily Kissner. As a group of fourth, fifth, and sixth grade teachers planned for interventions for next year, we decided to try some work with nonfiction summarizing. One of our first tasks is going to be to create some assessments. This isn't as daunting a task as it might seem. 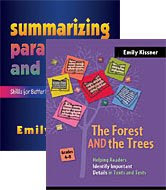 In fact, making your own summarizing assessments is much easier (and cheaper) than buying an expensive set from a publisher. And, while a summary is a useful indicator of reading comprehension overall, the very act of summarizing encourages students to think about important ideas and may actually improve comprehension. An assessment that instructs--just what every teacher needs! 1. Find a suitable text. I consider length, readability, and topic. The best texts are about a page long for younger students, maybe 2-3 pages for older students. You can run it through this tool from Intervention Central to find the readability. As far as topics go, I like to find something that I know will have moderate familiarity--maybe something that is related to a topic that we have studied in science or social studies. If a text is too familiar, some students might be tempted to skip the reading and summarize based on their background knowledge. 2. Find the important ideas. For this part, you need a team of 3-5 people. Each person should read the text silently and write down the most important ideas. Then, compare your lists. By working together, you should come up with a list of about 7-10 ideas for a one-page text. It's so helpful to have multiple people working on this, as you will find that each person has slightly different ways of putting the information. It can provide you with some insight about how hard it is for kids to summarize! If you can't come to an agreement on important ideas, discard the text and try a different one. 3. Give the assessment. I usually just hand out notebook paper for students to use for their summaries. When I make pages with lines, I'm giving students an indication of how long I expect the summary to be. I want to see what they think. 4. Create your scoring guide. The most basic scoring guide can just be a listing of the important ideas from the article. As you read a student summary, check off the important ideas that are included in the summary. Gather the team of teachers back together to read summaries and set performance levels. What do you want to call a proficient summary? An exceptional one? Be prepared for some interesting discussions as you look at the summaries. You may also want to consider how to score the summaries that go way overboard and include too many details. An extra box at the bottom of your scoring guide is an easy way to do this. 5. Use the results. What do your students need? Based on your results, you might make groups of students who need help with locating the important ideas from the text. You might also have students who write too many details, or students who include only topics from the text. Creating your own assessments is a great way to find out about where your students are. Give it a try! While I'm working on teaching nonfiction in my reading class right now, I'm still muddling along in science. This is our first year of working through the curriculum, and it's hard. Teaching the concepts requires a deep and well-developed knowledge--I often find myself reading and researching in the evenings and weekends! Our textbook is glossy and beautiful. However, it is not always the best resource for my students. Often it defines words using other difficult words. Most pages breeze quickly through important content. I've been working, then, to find other good resources. Reading A-Z.com has a few projectable books that fit in with our curriculum, and we have some choices in our bookroom. When I can't find what I'm looking for, I create things for my classes. 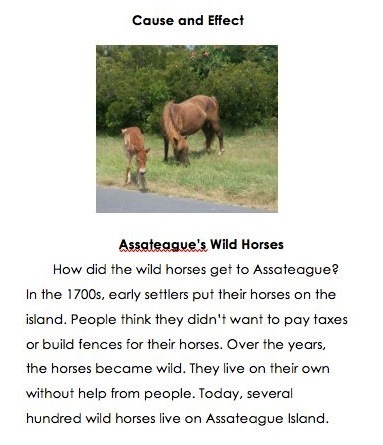 This "Animal Adaptations" text is an example of a short article that I wrote. At the start of a unit on animal adaptations, it's vital that students know how to pronounce the word "adaptations"! I wanted students to read a text that uses the word repeatedly, over and over. This would give them the schema they would need to find success in the rest of the unit. Sometimes, I do create a Powerpoint to illustrate the content. I don't like to do this for every concept, because I want students to have to cope with content area text. But some topics just lend themselves to teaching with bright, intriguing photos! The Behavioral Adaptations presentation below is an example. As we go, I encourage students to use the vocabulary as often as possible. Luckily, the room in which I teach science has tables, so students can talk with others and share their ideas. This makes the presentation less of a lecture and more of an interactive discussion. Working on new topics is never easy. But at least it's interesting! Those of us in the intermediate and middle grades often focus on helping students to look at a text and figure out the structure. One reason for this is the proliferation of text structure questions on state tests. Another reason is that older readers often have to cope with unfriendly content area text. Being able to find the text structure is a good coping mechanism for struggling readers. But young readers have to learn how to use text structure. When they are told that a text shows causes and effects, they need to be able to find those causes and effects. Younger readers need lots of work in taking ideas from a text and showing them on a graphic organizer. Identification is not as necessary for younger readers. Easy centers for teaching text structure can be found here. I created this compare and contrast projectable book for my son's kindergarten teacher. Joanna Williams has done a great deal of work on text structure and primary readers. One of her findings is that young readers don't really transfer the use of text structure from one structure to another. This means that teaching students how to use the text structure of cause and effect will not lead them to an understanding of compare and contrast. Each text structure needs to be examined on its own. This article from Sylvia Read and others outlines a way to teach chronological text structure. Start by showing students the book and the text structure. Then, show sentence strips with main ideas from the text, arranged out of order. Ask students to predict the order of the ideas. Introduce the sequence words as well. As you read the book, have students rearrange the sentence strips to reflect the order of ideas. At the end, discuss how the book shows the text structure. Students can practice with the book and the sentence strips during independent time. Even very young readers can learn how to use text structure. Most importantly, young readers bring their natural curiosity and enthusiasm to the task. When they are excited to learn about a topic, they'll understand that text structure is a tool to help them learn more. Here is a very simple Powerpoint that I used for teaching about text features. As you can see, it's simple, but I found it pretty effective. Having students look at text features across multiple texts helps students to see all of the different ways that text features can be used. Earlier I wrote about a unit that I planned for teaching students how to write thank-you notes. Now that I've started the unit, I am so happy with how it's going! Parents responded enthusiastically to the letters that I sent home asking for addresses and stamp donations. When it was time to write, students jumped right in. Some of them struggled with the form of letters--we'll work on this in the next few days! Others, though, struggled with the rhetorical task of letter writing. How to express greetings to a grandmother you see every day? How to start out a letter to someone you hardly know? At the end of class, we shared their writing challenges and successes. For students who were frustrated, I told them, "You are joining a long line of letter writers, through the centuries, who have had trouble with getting started writing a letter." There is something that is so neat about joining a club of writers! This week, we're taking a look at text features in reading class. From an early age, readers have to learn how to screen out information that isn't important. For example, when my kindergartener brings home copied Reading A-Z books, he knows not to read the reading level information on the front cover. My fourth graders, however, sometimes take this screening too far, skipping over headings and captions that carry information. Teaching about text features requires that students understand what features are. Once this is done, students can start looking for features in text--and thinking about what they mean. As I teach this, I try to move beyond just identifying the text features to helping students understand how to use text features. Here are some of my big teaching points. One of the difficulties for students is that text features can look very different in different texts. So I pulled together a large selection of nonfiction from the bookroom. Together, we looked at the different parts. How is the title written? What does this tell us about the text? What do headings look like? We discovered headings that are in bold print, headings in italic print, headings that are larger than the main text, headings that are written in different colors, and so forth. But they are all examples of headings. Kids need to see this variety in order to cement the idea of the heading in their minds. Why do authors use text features? At first, students had trouble with this question. (They seemed to believe that books appear from nowhere in a puff of air.) But then we started having an interesting discussion about why authors might choose some text features over others. The book The Amazing Impossible Erie Canal is decorated with illustrations, not photographs--why? Some books have questions for headings. How is this helpful to the reader? Why might the publisher of a book choose to have many photographs? After a day of looking through the books, students chose one to read with a partner. It was interesting to hear their conversations. "Mrs. Kissner, this one has made us ask a lot of questions, but it doesn't really have any answers," one student said. He was right--the book was one of the high-interest/low readability books that looks glitzy and exciting on the outside, but doesn't have much information. Another student noticed the cartoon pictures that decorated the margins of a different book. "It's like they're using fiction to tell us nonfiction," she said. She and her partner decided they didn't like the combination of cartoons and nonfiction. Text features have many different functions in text. They can highlight main ideas, show important details, or explain information. When students think about the jobs that the text features are doing, they can use the text features to help them understand the text. After we looked at all of the different books, students had the chance to choose one to read on their own or with a partner. The Text Features page below helped to give a structure to their reading. Thank-you notes are one of my least favorite writing genres. I always struggle with expressing my true appreciation in a way that does not sound stiff and over-formal. It's not surprising, then, that I often put off this rhetorical chore. But thank-you letters are an important genre for students to learn. Even as other forms of writing become less formal, thank-you letters are still required in many situations. I decided that a quick dip into thank-you notes would make a nice transition back to school from the holiday break. But, given my own problems with the genre, I decided to do some research before I created the assignment. Why are letters put together as they are? How is the form changing? I did some searching and found a treasure trove of old letters--the Paston letters, from five hundred years ago. These letters are from various members of a gentry family in England. Margaret Paston, even though she couldn't physically write, still composed many letters to others in her busy household, sharing news, asking questions, taking care of business. Letters from her children had much in common with what children ask of parents today. They are fascinating to read. After reading some of these letters, and commentary about them, I knew that I had to share these interesting details with students. I wrote a short article to explain to students how these old letters are similar to the letters of today, and how they are different. My fourth graders wouldn't get very far with the irregular spelling and archaic language of the letters, but I included some snippets of the texts so that they would get a feel for what this kind of writing sounded like. I didn't stop there. As I was reading the Paston letters, I started thinking about levels of formality in writing. When students write thank-you letters, getting the right tone is essential. Tone is easy for kids to hear in speaking, but harder for them to notice in writing. The correct tone for a thank-you letter to Grandma is going to be different from the tone to use as a thank-you for an interview. To help students start to notice this, I wrote a few example letters using appropriate and inappropriate tones. By the time I was done, I had an entire mini-unit with a writing checklist, compare and contrast article, examples for students to rate, and a rubric.